Sugar Haven Farms is located in the southwest corner of Steuben County in the town of Rexville, NY. My name is Eric Edwards and I represent the fourth generation of Edwards to work this farm in the rolling hills of Steuben County. My great-grandfather first moved to this farm in 1919. Through the years, we have been potato farmers, bean farmers, dairy farmers, and beef farmers. The farm is made up of 387.5 acres - 135 acres are tillable and the rest is wooded. Great grandpa started making maple syrup in 1919 and we have not missed a year since. Right now there are beef cows, pigs, and broiler chickens on the farm. We offer healthy, wholesome products, from animals raised without hormones and antibiotics. We use proven approaches to agriculture in a sustainable model that benefits both the land (the billions of microbes found in one handful of soil) and the caretakers of the land. 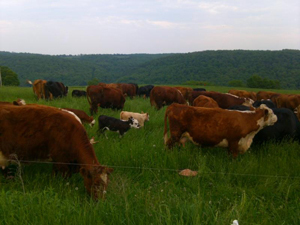 Our grass-fed pasture system is ideal for the animals and the environment. Our animals live naturally on our pastures, grazing the forages growing in our fields. In the summer, we harvest the excess growth and feed it as hay in the winter. The animal wastes return to the land and become nutrients for the next grass cycle. We grow our food in a way where there's nothing to hide. The public is welcome to stop by the farm anytime, 7 days week, 365 days a year. The farm is always open to the public, but please allow us our privacy at our home. The cattle we use are beef cows which are physciologically developed to efficiently grow muscle on their bodies. As opposed to dairy cattle which are physciologically developed to make milk with the food they eat. This is an important distinction as grass fed beef from a dairy cow is a much different product than grass fed beef from beef cow. All of our cattle are beef cows and most are from the Hereford breed with a small mixture of Angus beef cattle. The cows are pastured in the Spring, Summer, and Fall and are rotated into fresh paddocks of grass daily. By restricting them to one paddock each day, rather than letting them roam, our cows more thoroughly eat and trample down the grass in the area, while adding their wastes. That process of mowing, trampling and fertilizing is very beneficial to the pasture and the soil that supports it. This is known as rotational grazing and it mimicks what herds of grazing animals have done in nature for thousands of years. It helps build better soil, while constantly moving the animals away from their waste products to fresh grass. The most important factor is that cattle are the most important part of healthy soil. WIthout healthy soil all products gleaned from the fields lose nutritional value. This is something that can be tasted in each product at Sugar Haven Farms. Healthy soil and happy earthworms create an environment for nutritionally dense foods. Their meat is considered "salad bar beef" because they feast on all the variety of fresh forages that our farm has to offer. Our broiler chickens are cared for in a brooder for two weeks until they develop some feathers. Then they are moved outside to 12' x 10' pens. This gives them access to the pastures while protecting them from natural predators. The pens are moved daily to allow the broilers to eat grass, bugs, flies, and other insects, in addition to the Non-GMO grain we provide. And once again, the daily movement of the pens to new ground gives them new feed, while leaving a perfectly fertilized area behind. This system of raising chickens through daily moves to fresh grass is referred to as "pastured poultry". The resulting meat is markedly different from even the so called "free range" chickens that you find in the grocery store, both in nutrition and flavor. You can bet your life that no one was ever moving those chickens daily to fresh turf. In all likelihood, their feet never touched grass. Once the pigs reach one hundred pounds and are introduced to electric fencing, they stay outdoors in paddocks. The pigs are rotated about every ten days to fresh paddocks, not to return to the same site for an entire year. These pigs are kept in doors until one hundred pounds because Black Bear predation is a very real problem in these Steuben County hills. Usually at one hundred pounds they can out maneuver the slower Black Bear. They eat Non-GMO feed, roots, whole corn, and whatever else they may rut up. Pigs are intelligent creatures and are not meant to be confined to cement floors and buildings. They have a terrific tool, their snubby noses, that they love to rut with. They grow quickly and live a great life, doing what pigs love to do. Much of my inspiration is from Polyface Farm located in Swoope, VA. I apply many of Joel Salatins' ideas to my own farming techniques. If you want to further your understanding of Sugar Haven Farms philosophy, please youtube some of Joel's lectures. Joel is a dynamic speaker and you will find his thoughts both entertaining and refreshing. 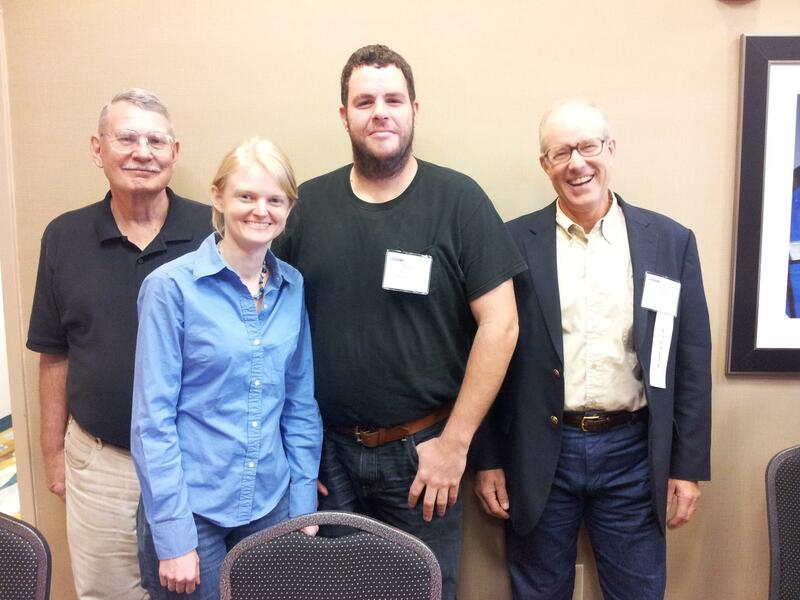 Here I am with Alan Nation (owner of Stockman Grass Farmer), Sherry Salatin, and Joel Salatin. We were at a Pastured Pork 3 day workshop. What a great time!